7264 Imperial Inspection is a Star Wars Episode VI: Return of the Jedi set that was released in 2005. 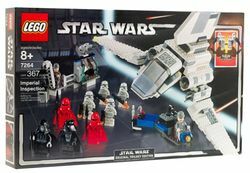 The set included 367 pieces to assemble a Lambda-class shuttle, a crane, cart, and ten minifigures: Emperor Palpatine, Darth Vader, two of the Emperor's Royal Guards, four Imperial Stormtroopers and two Imperial Officers. This is the second version of the Imperial Shuttle produced, updated from 7166 Imperial Shuttle, which did not have nearly as many of accessories or minifigures as this one. The Imperial Stormtroopers seen in this set are a unique variation not included in any other sets. This is the first set of 2005 with the new grey faced Emperor Palpatine. This is a description taken from LEGO.com. Please do not modify it. The Emperor has arrived! The Emperor has arrived to inspect the new Death Star! Imperial forces stand at attention as Darth Vader meets the Emperor at his Imperial Shuttle. Recreate the Death Star hangar with a cargo vehicle and command station with moving crane! Protected by his Royal Guards, Emperor Palpatine is sure that no Rebels will disrupt his evil plans. Includes 10 minifigures in all: Emperor, Darth Vader, 2 Royal Guards, 2 Imperial Officers and 4 Stormtroopers! Features moving wings and a removable passenger compartment. Facts about "7264 Imperial Inspection"
This page was last edited on 9 February 2019, at 21:53.